Yesterday I drove up to Berkeley to watch the eighth round of the Berkeley International 2008 tournament. This time I remembered to put new batteries in my camera. So yes, we have photos! Daniel Rensch gave a 30-minute lecture before the round, in which he showed part of his game the previous day with grandmaster Sharavdorj. He talked about pawn structures in chess, and how in the French Defense White will tend to attack on the kingside and Black will tend to attack on the queenside. The kids in the front row are named Nathan and Diana. I think that he had about ten kids in the audience overall. 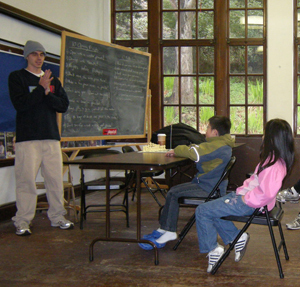 Note that behind Daniel is the infamous blackboard with the opening principles written on it, including “7. Castle as soon as you can.” As I mentioned in an earlier post, Jesse Kraai followed this advice in round two, and regretted it. 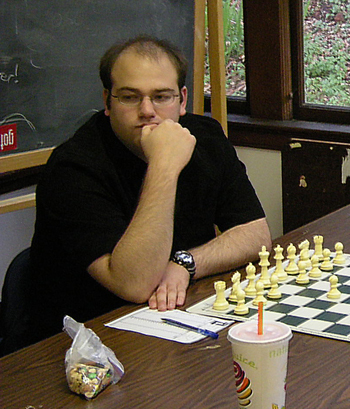 Josh Friedel strikes a pensive pose during his game against Zviad Izoria. On the chess board, it was 1. e4 versus 1. … c5. Off the chess board, it was trail mix versus Jamba Juice. The final result was trail mix Â½ — Jamba Juice Â½. As mentioned in an earlier entry, keeping warm is a real challenge at this tournament. It was warm enough yesterday that tournament co-leader Irina Krush was able to take her coat off. Nevertheless, she still took the opportunity to warm her feet next to one of the two space heaters. By the way, it’s just an accident that she sat right next to a Chess Life cover photograph of Anna Zatonskih (background). After their games were over, some of the players went across the hallÂ to check out the action in the Berkeley Chess School office. The computer is hooked up to the Internet Chess Club, and the deputy tournament director (I think his name is Anup, but I’m not certain) shuttled back and forth between the playing room and the office to update the moves. Left to right: Vladimir Naroditsky (Daniel’s father), Lev Milman (seated), Zviad Izoria (in hat), Josh Friedel. I’m not sure who that is behind Dr. Naroditsky, but I think it might be David Pruess. A big topic of conversation yesterday, of course, was IM and GM norms. One player was obsessed by the norm chase. Marc Esserman said — not seriously, but also not completely facetiously — that he “lost his game on purpose” to Giorgi Kacheishvili in order to improve his chances for a norm. How is that? Among the byzantine rules governing international norms is that you have to play at least four games against foreign players in order for the norm to count. The game against Kacheishvili was Esserman’s third against foreigners. The problem is that there are only two other foreigners in the event: Dale Haessel and Sandor Kustar, both of whom ended round eight with scores of 3/8. If Esserman had beaten Kacheishvili, he would have had a score of 5/8, and would have been ineligible to play either Haessel or Kustar because his score would have been too good. Even a draw with Kacheishvili would have required a somewhat dubious pairing of a player with 4.5 points against a player with 3. Tournament directors are allowed some flexibility in the pairings, but if there are too many “strange pairings,” the whole validity of the tournament could be called into question. Basically,Â Esserman said, he would have been happy with a win against a GM like Kacheishvili, even if it spoiled his norm chances. But he was also happy with a loss. The only thing that he didn’t want was a draw. So, even though he isn’t normally a King’s Indian Defense player, that was the opening he chose. He launched a wild kingside assault as Black, sacrificing a couple pawns. Of course the attack failed — Kacheishvili knows how to handle the White side of the King’s Indian. (See Kacheishvili-Sharavdorj, for example. )Â So no, Esserman didn’t lose on purpose (that would have been an insult to Kacheishvili), but he did deliberately play a type of game that was either going to win or go down to a fiery defeat. At the opposite extreme, Irina Krush, who is in the running for a grandmaster norm (although it will be difficult), said that she was not thinking at all about the norm. “I’m just trying to play my game,” she said. And Rensch, who is a virtual shoo-in for an IM norm, was somewhere in between. He said that he has missed so many IM norms that he was not going to stress over it if he missed another. After all the games were done, David Pruess worked out the norm situation for me, and as best he could tell, this is who needs what. Rensch, with 4.5/8, is in the best shape. It would appear that he has already clinched a 9-round IM norm, provided he plays a fourth foreign player. He has been paired against Kustar for the next round. Yes, a 4.5 against a 3 is a stretch, but we’ll have to cross our fingers and hope that FIDE accepts it. I am sure that John Donaldson would not have approved the pairing if he didn’t think it was legal. So basically all that Rensch has to do is show up and play a move (even the Fool’s Mate), and he will be an IM. Esserman, with 4/8, needs a draw today against Haessel. That will give him enough points and it will give him the requisite four foreign players. Iryna Zenyuk has come out of nowhere with wins the last two rounds, to reach a score of 4.5/8. Even though her score is the same is Rensch’s, the average rating of her opponents has been lower, so it appears that she still needs a draw today against Kacheishvili to get an IM norm. That could be a tall order, although she will have White. It also appears that she has already qualified for a women’s grandmaster (WGM) norm. Congratulations! Irina Krush still has an outside shot at a (“men’s”) GM norm. She has 5.5/8, and it appears that she will need to win both of her final games. She goes up against Friedel today. If she succeeds, it would be her second GM norm. No American woman has ever earned a men’s GM title, so she would be just one step away from making history. Daniel Naroditsky, who lost to Zenyuk yesterday, must be bitterly disappointed. After six rounds he had 3.5 points and an excellent shot at an IM norm. But he has lost his last two games in a row, and he would now appear to be out of the running, unless he can turn it around and win two in a row. All of these computations are provisional, of course. One thing that surprised me is that you can earn a 9-round IM norm in a 10-round tournament. That is, if you score well enough in the first 9 rounds that you would earn a norm for a 9-round tournament, then you are credited with the norm. It doesn’t matter what happens in round 10. This sounds very strange to me. Is there any other sport where you only have to play 9/10 of the tournament? But David assures me that this is the way the rules work. That’s why so many people can clinch norms today. However, Irina cannot clinch a GM norm today. It turns out that 6.5/9 isn’t good enough; she has to get 7.5/10. Your head is probably swimming by now. My head is swimming, and I’m a mathematician! So I’ll end this entry with a short interview I did with Irina after she finished yesterday’s game. I asked her, first of all, what she thinks her best game so far in this tournament was. She immediately answered that it was her game with Esserman, which I analyzed in an earlier post. “The move 11. Nd5 was one of the best moves I’ve played in a long time,” she said. 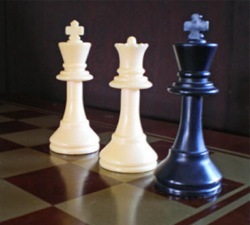 “That was a good example of a move that wasÂ a product of a long think.” What makes it tricky is that Black can actually take the knight — the computer thinks that taking the knight is Black’s best move — and so what lies behind the move Nd5 is not a tactical sequence but a positional evaluation of the endgame that it leads to by force, if Black takes the knight. The computer is not so good at that kind of strategic judgement. As a result, Irina said, “The computer doesn’t even consider 11. Nd5 to be in the top three moves.” Instead, it prefers more “normal” moves like 11. Bd3. That was where the second part of Krush’s positional judgement came in. She looked at the “normal” moves and felt that if she just continued routinely her advantage would start to dissipate. There’s a good lesson here: a move with a plan is better than a generic good move with no plan behind it. Of course, as you know Esserman declined the pseudo-sacrifice, and as a result Irina got a better position than she would have by playing the “normal” move. I also asked her if she had prepared the opening for Esserman, specifically the gambit 5. h5. She said that her “preparation” lasted all of 15 minutes, after midnight the night before. She knew Esserman played the Dutch Defense, and found the idea of 5. h5 in some games by Radjabov. That was basically all she knew about it. She enjoyed the chance to play in gambit style, which as a 1. d4 player she doesn’t get to do so often. How about preparations for this tournament? I asked. “None!” she said. “No preparation, nada.” She had played in the Olympiad last month, and after she came back home she got the flu. That even delayed her flight to the west coast, because she wasn’t well enough to fly on the day she had originally planned. She agreed that the round one game against Iryna Zenyuk was the closest she has come to losing a game this tournament. “She is one of my least favorite people to play, because she is my close friend,” Krush says. Krush says that she got an advantage early on but played a couple moves out of order, and then played badly in time trouble. Zenyuk won a pawn in the endgame, but then she also missed some chances and, surprisingly, ended up on the defensive even though she was a pawn ahead, and had to find a good move to save the draw. It was easy to tell that Krush and Zenyuk are good friends. After I was done talking with Krush, Zenyuk came into the room, fresh from her dramatic victory over Naroditsky, and the two were soon chatting excitedly about the game in Russian. Most of the conversation wasÂ too fast for me to follow, but I did catch Irina telling Iryna, “Molodets!” which translates roughly as “Atta boy!” (Or in this case, “atta girl!” or perhaps “you go, girl!”, which sounds a little less dated). I also had to ask Irina about the famous Kasparov versus World game, which took place in 1999, when she was just 15 years old. There are lots of places online where you can read the fascinating story of this game. For example, check out this description, by a person who is not a strong chess player but is writing a book about collective intelligence. The Wikipedia article is also very good. Kasparov called it “the greatest game in the history of chess.” It wasÂ a four-month battle, one move per day, where anyone in the world could vote on the World’s move at a website that was set up by Microsoft. A panel of four strong junior players,Â including Krush,Â was supposed to recommendÂ a move each turn (each player working separately), in order to steer the World’s moves towards good moves rather than blunders. What happened was completely unexpected, even by Kasparov. As the game progressed, Krush became the nexus for the World team’s analysis. A “GM school” in Russia was analyzing the game at the same time, but after a whileÂ some grandmasters started sending their analysis to Krush, because she was keeping the best records and making theÂ most compellingÂ arguments for her recommendations. For forty-one consecutive moves of this immensely complex game, the World team voted for the move that Krush recommended! From move 10 to move 50, it was basically Kasparov versus Krush. And after move 50, according to endgame tablebases, the position should have been drawn. Unfortunately, on move 51, when the World finally deviated from Krush’s recommendation, they voted for a losing move. (There are allegations that the vote was tampered with; we will neverÂ know for sure. )Â So basically Irina played the world’s greatest player toÂ a standstill for 50 moves in the best game of his life. I consider it one of the greatest feats in chess history by a teenager. It’s kind of sad that a game like this could never happen any more. Computers now are too strong; everyone would just vote for the move that Rybka recommends. Also, the specific endgame that was reached in Kasparov vs. World, a seven-piece endgame, has now been analyzed to perfection. In 1999, seven-piece endgame tablebases did not exist yet (only six pieces!). OK, back to the present. With two rounds to go in the Berkeley International, the leaders are Kacheishvili with 6, Krush and Izoria with 5.5, and Friedel with 5. Great blogs! Was very nice to see how entertained some people were by the tournament (and hopefully some were getting something out of the live relay!). As you might have guessed, I was the one relaying so now you have my correct name (though to be honest since I know you did at one point follow the US Chess League, I figured you’d know who I am, especially since I think you and I actually played a tournament game many, many years ago in the Midwest). But in any case, I wasn’t a tournament director of any sort, was just helping out in transporting people to and from the site and of course relaying. But thanks again in any case to you and fpawn for providing commentary on this tourney, I hope those reading and watching enjoyed it as much as we apparently did! Sorry that I didn’t recognize you and also got your name wrong! Yes, of course I have seen your name many times in connection with the US Chess League, and I’m glad finally to have a face to connect with the name. I didn’t remember playing you at all, but out of curiosity I looked through my old game scores, and sure enough, there you were! It was the Kings Island Open, near Cincinnati, in 1992. You must have been very young then. Did you by any chance also have a sister who played chess? Was her name Upma? Anyway, I had not studied our game after we played it, and that explains why I didn’t remember it. Looking at it now on the computer, I can see why I didn’t want to look at it back then — the play was extremely ragged on both sides. According to the computer, I got a large advantage out of the opening, but missed my chances to open the game up. Then — too late — I played a really bogus pawn sacrifice, and then you had the advantage. You defended inaccurately, and then I had the advantage. Then I missed my chances to break through tactically, and it was even. Then I missed an obvious two-mover, and after that the computer says you had a humongous advantage — something like 18 pawns! You had two passed pawns, and I couldn’t stop them both. But by some sort of miracle I managed to create enough tactical complications to confuse you, and it ended up being a draw by perpetual check. What’s interesting is that we both displayed the same kind of misjudgement — an inability to play a really decisive move when the position called for it. Me more than you, I’m afraid. Let me know if you want me to send you the game score! Yes, I was quite young back in 1992 (12 probably); not sure why I remembered playing you to be honest, just my years of tournament chess weren’t especially numerous (only a few years) so I suppose that gives me an easier route to recall those tourneys and players I did play. Yes my sister Upma also used to play (though she’s be in retirement from playing tournaments longer than I have been I think)! I vaguely recall that game we played also (don’t ask me why again, I have no idea); perhaps it was because it was the game which made me give up the opening I played in it perhaps! I probably have it back at my parents’ house somewhere, but it might pain me to look at it and realize how badly I played (and your description kind of tipped me off on that!). Thanks for the link, Arun. I’m definitely considering joining with ICC. It isn’t as expensive as I thought, only $5 a month, and I can swing that. But for now, it’s good to have another source for the games.